Isolation earphones are essentially ear plugs with tiny speakers implanted in them. 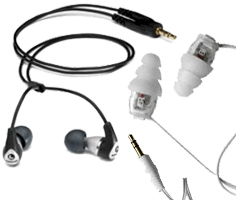 When isolation earphones are used by musical or stage performers, they are often called Musicians Monitors. Whether they are called isolation earphones, canal phones, in-ear earphones, or musicians monitors, these earphones are all made to do the same thing: let you listen to music while reducing the ambient sounds you can hear. The ear plugs drastically reduce the ambient noise that can enter the ear, while the speakers deliver music directly into the ear canal for crystal clarity and superb fidelity even at low volume levels. Of course the more they cost, in general, the better will be the sound quality. Universal fit isolation earphones and musicians monitors are ideal for stage performers, frequent flyers, commuters, athletes at the gym or running, workers at the job or in the home workshop, and for general music or radio listening enjoyment. We offer a separate category of workplace earphones that are made specifically for use in industrial high noise settings, and are provided with an NRR rating that tells you how effective they are at protecting you from external noise. All of these earphones are fully compatible with iPods, MP3 players, CD Players, XM radios, Scanners, Professional Musicians Monitor Systems, and regular stereo systems. Some applications may require adapter plugs, but the earphones are fully compatible. All of these earphones can be fitted with custom molds as well, giving you a perfect fit and eliminating the need to buy replacement ear tips. See Custom Molds for Earphones for more information and to order custom molds. InEarz Zen 2 Universal Fit In-Ear Musician Monitor Earphones provide a high, deep, and rich soundstage via quad balanced armature drivers in a robust single bore shell. Now you can get InEarz bleeding-edge ADEL™ Technology in a universal fit model that is ready to bring you full, smooth, extended bass sound right off the shelf. Flares JET 1 Polymer Earphones feature a precision-machined high tensile polymer body housing a 10mm driver. Innovative patent-pending pressure balancing jet technology maximizes the front output from these earphones, delivering deep bass, rich details, and clear nuances. Sleek black satin finish. Flares JET 2 Aluminum Earphones feature a precision-turned aerospace aluminum body housing a 10mm driver. Innovative patent-pending pressure balancing jet technology maximizes the front output from these earphones, delivering deep bass, rich details, and clear nuances. Modern machined metal finish. Flares PRO Earphones feature an aerospace-grade titanium shell and superior sound quality. Dual jet technology provides precisely balanced sound and acoustic lens technology provides accurate delivery. Switch effortlessly between wireless Bluetooth® or traditional wired listening. $469.97 Flare Audio Flares GOLD Wireless Bluetooth Earphones - Free Shipping! Flares GOLD Earphones provide the ultimate fine listening experience for the discerning audiophile. The brilliant 24ct gold-plated finish is sure to leave a polished impression. Cutting-edge Dual Jet and Acoustic Lens technologies deliver sound with unparalleled accuracy. Pure, professional sound. Westone 2 True-Fit Personal Listening Earphones With FREE Portable Amp! Limited Quantity (when they are gone they are gone): This Westone Product comes with a FREE FiiO E6 Portable Amplifier. Westone 2 true-fit dual driver in-ear isolation earphones were designed specifically for personal listening. Great sound across the mids and highs, with a terrific low-end punch as a bonus. $649.99 Westone Model UM2 Universal Fit In-Ear Musician Monitor Earphones With FREE Portable Amp! Westone UM2 universal fit in-ear musician monitor earphones are an excellent choice for the professional musician and audiophile alike. No custom fitting required. Westone Universal Monitor Model UM2-RC With FREE Portable Amp! Westone UM2-RC universal fit in-ear musician monitor earphones w/Removable Cable are an excellent choice for the professional musician and audiophile alike. No custom fitting required.